Long peripheral to the mainstream of HIM work, careers in research are sometimes looked upon by HIM professionals as belonging to those inhabiting the ivory towers of academia in which the need to "publish or perish" consume an elite holding PhDs and presiding over informatics programs designed to produce bachelor's and master's degree candidates. Actual instruction is often farmed out to one or two full-time faculty members supplemented by a fleet of adjunct instructors who turn over frequently. However, AHIMA is making efforts to put these perceptions in the rearview mirror. Many HIM professionals working in the coding, data management, and HIM functions are only vaguely aware of AHIMA's research branch. However, as evidenced by the presentations at AHIMA's 2018 Assembly on Education, that may be changing. The gathering, which spotlighted the skills needed to execute research functions, featured tracks devoted exclusively to research. In addition, AHIMA's Foundation Research Network was introduced. More pragmatically, AHIMA's recent focus on data analytics skills was emphasized throughout the assembly. In individual and panel sessions, David T. Marc, PhD, MBS, CHDA, and Ryan H. Sandefer, PhD, MA, CPHIT, discussed the use of these new analytics skills in research projects taking place in health care entities around the country. One of the positive aspects of IT development is the number of individuals and organizations who are willing to share their development expertise without reimbursement. This is particularly true for academia. Understanding that universities and students specializing in health care professions have limited resources, companies are coming together to create synthetic patient data that can be used to teach students skills deployable in today's data-driven health care environment. In the Faculty Development Institute, Sandefer and Marc demonstrated the development of synthetic patient data and how to apply use of those data for HIM educational purposes. 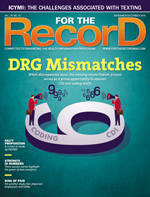 One of the obstacles of research in many medical domains is the lack of access to patient data in large databases with sufficient data integrity to accommodate verifiable research efforts. HIM students hoping to specialize in research pursuits must have adequate data organized in repositories on which to test new skills. Four prominent HIM members of the Graduate Resources Alliance Workshop presented a highly focused session ("Putting STEM Into HIM") on creating STEM (Science, Technology, Engineering, and Mathematics) pathways for HIM students. Dilhari DeAlmeida, PhD, RHIA; Anita Hazelwood, EdD, RHIA, FAHIMA; Susan Fenton, PhD, RHIA, FAHIMA; and Victoria Wangia-Anderson, PhD, FHIMSS, promoted the need to move programs and students in the science and research direction, pointing out that financial and human educational resources go increasingly to programs related to STEM. AHIMA educational leadership repeatedly pointed out the need for more advanced mathematics and statistics training starting with associate programs and growing in complexity as students advance to graduate school. The emergence of health informatics, a popular topic at the assembly highlighted by speakers such as Dawn Paulson, MJ, RHIA, CPHS, CPHI, is reflected in AHIMA's new career map (in beta mode). The map, which is divided into Coding and Revenue Cycle, Information Governance, Informatics, and Data Analytics quadrants, displays numerous career pathways for those entering HIM domains. For example, the nascent position of informatics researcher describes a career devoted to the development of new data collection methods and the ability to find "appropriate data to collect for projects and in support of research grants." In the data analytics quadrant, mapping specialists "develop and maintain mappings between health care–related data and code sets including SNOMED CT and classifications or other terminological systems." There's also a new role of population health analyst whose job is to turn population health research into performance and quality improvement metrics. In addition to the career map, there are new draft curricula guidelines for graduate, baccalaureate, and associate levels of instruction, each of which is built using Bloom's taxonomy to suggest levels for each step in the educational process. At the graduate level, Domain III (informatics, analytics, and data use) devotes a full section to the proposal of evidence-based research. • critical analysis of current research, and publication requirements. As research positions become more attractive career paths, HIM students will have a handy venue in which to publish research efforts. The AHIMA Foundation's Perspectives in HIM, a respected research journal, is home to publications by physicians, nurses, and other health care professionals. A quick search of the journal for the RHIA credential reveals interesting titles by HIM professionals, some of which are written in conjunction with other allied health care professionals, including "Utilization of Lean Methodology to Improve Quality and Efficiency of Rehabilitation Electronic Health Record Documentation" and "The Role of HIM Professionals in the Use of Geographic Information Systems." Christi L. Lower, RHIA, MS, FAHIMA, academic affairs operations manager for AHIMA, leads the effort to inform membership of the support they can receive if they have conducted research or are considering research development. In the 2018 preconvention bulletin, she urges members to "become aware of networking opportunities, special events, advocacy of further research, and research opportunities." The convention itself hosted events such as a research meet-up and a session titled "Innovative Ideas: Steps Practitioners Can Take to Publish Their Work." Beyond mastery of data analytics as a research career progression for HIM students, there is a growing need for HIM professionals interested in understanding the need for researchers to access data from archival electronic health information storage systems. In a HIMSS paper titled "Managing Clinical Research Information: A Case Study in Information Access, Presentation, and Analysis," authors Raza Hashim, PhD; Thomas L. Lewis, MD; and Stephen J. Rosenfeld, MD, describe the National Institute of Health's (NIH) construction of an information architecture designed to facilitate both patient care and research. Prominent in the discussion are job skills that would involve taking a 25-year-old clinical record tape archival and analyzing, developing, and attaching metadata to the contents to enable retrievability for research purposes. The authors note how this is challenging in that there are "several hundred million observations collected over the past 25 years." HIM students seeking research support jobs must understand data modeling and data management. The information mapping exercises in informatics programs can help them master tasks such as mapping the 150 gigabytes of data in NIH systems and developing normalized data models. AHIMA's beta career map places the role of cancer registrar in the Coding and Revenue Cycle Management quadrant, a decision that likely will be amended as it becomes evident that cancer registry work is a part of research in that it yields high-integrity data for analytical efforts. At AHIMA's 2017 convention, Nancy Kadish, MA, RHIA, FAHIMA, vice president of clinical research and data abstraction at CIOX Health, and Patty T. Sheridan, MBA, RHIA, FAHIMA, senior vice president of HIM services at CIOX Health, spoke about the growing job opportunities in the domain of patient registries. Kadish and Sheridan examined the differences between neurovascular, brain tumor, and spine registries in terms of how they can be prepopulated from electronic record systems or other "sources of truth." This fits in line with the notion that a major portion of a registrar's job—such as creating cancer treatment encounter abstracts—can be partially autocompleted through source systems to prepopulate registry abstracts. Completing these tasks requires registrars to locate required data elements in diverse clinical systems and to ensure source system data have the same high integrity as if a human being had completed the abstract fields. In fact, the pursuit of a career in registry management involves mastering many of the same skills sets demanded by the NIH or any of the large cancer research centers around the country. — Sandra Nunn, MA, RHIA, CHP, is a contributing editor at For The Record and principal of KAMC Consulting in Albuquerque, New Mexico.